The bar model method is a key part of the Singapore maths mastery approach now being taught in primary schools. Mastery expert Kate Moore from Maths – No Problem! explains the thinking behind the method and how you can support your child's learning at home. Bar modelling is part of the concrete > pictorial > abstract (CPA) sequence when teaching certain maths topics. The process starts with using real-world, tangible representations before moving onto showing the problem using pictorial diagrams, and then introducing the abstract algorithms and notations (such as the +, -, x and / symbols). What is a bar model? The bar model method is pictorial, and develops from children handling actual objects to drawing pictures and then drawing boxes, each of which represents an individual unit, to represent objects. Eventually, they will no longer need to draw all the boxes; instead, they just draw one long bar and label it with a number. Sam bakes 20 cookies. If he gives away 8 cookies, how many would he have left? In the concrete stage, children might use actual cookies (or, in a lesson, multi-link cubes like Numicon or counters to represent them!) to solve the problem. In the pictorial stage, instead of physical objects they use drawings to represent each cookie (they might draw cookies or blocks or counters or dots to represent them). In the abstract stage, they are able to solve the problem using conventional mathematical notation: 20 - 8 = 12, writing out a number sentence. 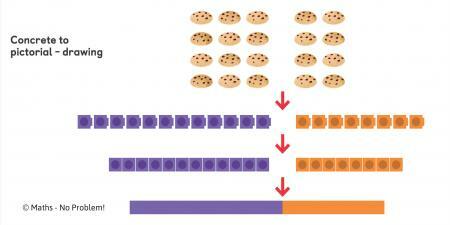 To solve a problem like the one above using the bar method, children draw one short bar representing the eight cookies alongside a longer bar representing the remaining (twelve) cookies. The bars don’t need to be precisely measured, but they do need to be proportional, so children can see the difference between them and the numbers they represent. When is the bar model method introduced to children? Children who are following the Asian maths mastery method are taught the foundation of bar models, for example using linking cubes, in the first term of Year 1. In Year 2 children might use the bar model method as a visual way of solving calculations for addition, subtraction, multiplication and division. They are particularly useful when solving multi-step problems involving missing numbers. Bar models don’t give you an answer – they give you an understanding of what to do in order to get to the answer. Children need to have strategies to add, subtract multiply and divide for them to use bar models. Bar modelling is not a ‘quick fix’ tool and will only work if the pupil has a good understanding of key concepts. It’s also important that children set out the bars correctly. If pupils are messy with the bar model or use the wrong model for a problem, this can prevent them from seeing how to solve the problem.